Seems like years, actually over a decade, since I first tried Thai food and swore up hill and down dale that I would learn to cook it. There are several cookbooks on my shelf as a testament to my good intentions about learning to make Thai food at home. Yet nothing ever came of it. Until now. After having a couple of nice Thai meals with Papa on my visit to Toronto, and forming some nice sweet memories of those walks together around the Asian neighborhood near Dundas St., I wanted to try and recreate one of those recipes at home. The outcome was very pleasurable. Papa said that he liked it even better than the soup we had at the restaurant. So I’ve decided to pass the recipe along to you. 1. Dice shallots and squash. 2. Saute shallots and garlic in olive oil until shallots soften. 3. Add all liquid ingredients (except honey) to the pot and simmer for 5 minutes over medium heat. 4. Add honey, bay leaf and spices along with squash chunks. 5. Cook for 15-20 minutes over med-low heat until squash is soft. 6. Using an extra pan, pour portions of the soup into a blender and puree. 7. Replace pureed soup into pan and test for flavor. Respice if necessary. 8. Serve with bamboo shoots or a couple of mint leaves for garnish. 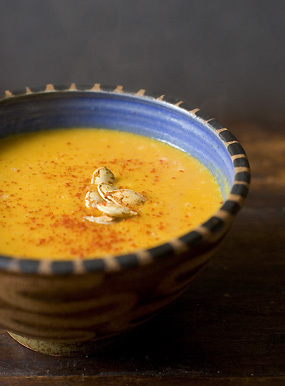 This sweet and spicy soup is delicious for a warmer-upper on cool autumn evenings. If you are so inclined you could prepare some Thai Veggie Rolls with chili dipping sauce as a side dish. When serving, I like to use nice Asian-inspired serving dishes and renge spoons. Saw this on Chef Erik’s veggie carnival. Love your soup recipe.